It's an automaker's job to improve on previous models, but sometimes they get it so right that the previous generation is completely overshadowed. With your help, we put together a list of the ten cars overshadowed by their successor. Why It's Overshadowed: Power for the E34 M5 came from a 3.6 liter straight-six producing 311 HP, which meant the car would reach sixty in a respectable 6.4 seconds. The car was featured in Ronin, which is a testament the E34's awesomeness. The E39 M5, however, was miles ahead of the E34 in performance and quality. Power came from a 400 HP 4.9 liter V8 and sixth came at a much faster 4.5 seconds. The E39 M5's hoontastic power and refined comfort make us forget an M5 even existed before the E39. Why It's Overshadowed: The release of the Prius was super sneaky, so sneaky, that I didn't know it existed until a two years after the second gen Prius was released. It was essentially a Toyota Echo/Platz with a hybrid drivetrain much like the one in the second generation Prius. Fitting in a completely new market, it was difficult for the Prius to gain the following that the second generation Prius received. Why It's Overshadowed: The CTS is the car that revived GM's Cadillac brand. With stealth aircraft-inspired styling and the Corvette's engine in the CTS-V, this car was more than enough to handle for pedal mashers. Then the current generation CTS comes and blows it out of the water. Take a supercharged LSA engine based on the Corvette ZR-1's LS9 and what do you get? Enough power to forget that the previous generation CTS-V was cool, too. Why It's Overshadowed: The first generation Charger is called by many "a good-looking AMC Marlin" or "a Marlin on steroids" but the Charger is just badass wrapped in a 440 Magnum, individual bucketseat, fastback package. You may remember the 440 Magnum from such masterpieces as Bullitt and that should be plenty. The second generation Charger, produced from 1968 to 1970 seems to be the car of choice for Charger enthusiasts. Maybe it has something to do with the second generation of Charger having been the General Lee. Why It's Overshadowed: The R34 Skyline is one of the most iconic vehicles to come from Nissan, yet we cannot get over the R35 GT-R, also known as Godzilla. Why? Probably because we didn't get the Skyline stateside without having to jump through hoops or risk vehicle seizure. Maybe it's because of the R35 GT-R's massive power numbers or its 'Ring times. Point is that the Skyline GT-R was popularized by The Fast and the Furious while the R35 GT-R was popularized as a Porsche 911 Turbo killer. Why It's Overshadowed: In 2010, the choice between the redesigned V6 Mustang and the Mustang GT was pretty obvious. Chances are you'd pick the 315 HP 4.6 liter V8 Mustang GT. Then 2011 rolled around and like all those iPhone 2G early adopters, you feel like an idiot. Now you can have a V6 Mustang with 305 HP and better fuel economy than the 2010 GT or you could have the 412 HP 5.0 liter V8 in the 2011 GT. 2010 Mustang who? Why It's Overshadowed: 405 HP, 3.9 zero to sixty time, and a suspension tuned on the Nürburgring are just a few things available from the C5 Z06. The following C6 Z06's LS7 produced a massive 505 HP and the new Corvette's styling was race-inspired, designed for the American Le Mans series. The growl of the C6 Z06's 7.0 liter engine and its good looks can make one forget all about the C5 Z06. Why It's Overshadowed: The EB110 was unveiled on Ettore Bugatti's 110th birthday and was the first Bugatti product in 40 years. The EB110 featured a 3.5 liter quad-turbo V12 engine that produced 553 HP. In 1998, Volkswagen AG purchased the Bugatti rights and would produce cars under the marque. VW got to work, managed to put together two V8 engines based on the VR6 engines, slapped four turbochargers to that, like on the EB110, and put it in a car called the Veyron. The Veyron's quad-turbo 1001 HP W16 engine would make it the fastest car on the earth, for a short time at least, and would erase any memories we had of the EB110. Why It's Overshadowed: This was the first year that Celica and Supra were dissociated. There was much to love about the Supra's 200 HP (or Japan's 276 HP twin turbo model), it's rear-wheel drive rear end twitchiness, and it's dual wishbone front and rear suspensions. However, there was much more to love in the Mark IV Supra, including an inline twin turbo setup on the 2JZ, producing 320 HP in later models with almost no lag. Enthusiasts are still clamoring for the Mark IV Supra, while the Mark III can be had for cheap, though quite riced. Why It's Overshadowed: This homologated special of the 308 GTB was meant to be a Group B beast and only 272 cars were produced. The 288 GTO's 2.85 liter V8 was twin turbocharged and produced 400 HP in 1984. In 1987 Ferrari produced F40, a 40th anniversary special, that became the halo car of an era. Power came from a 471-HP twin turbo 2.9 liter v8 based on the GTO's engine. 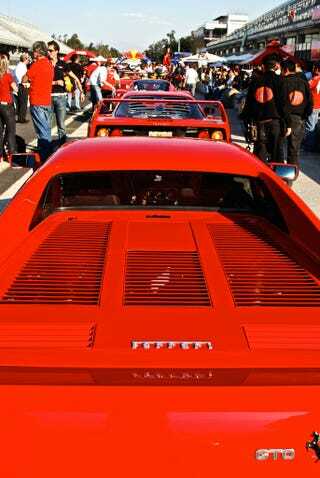 The F40 was easily able to overshadow the 288 GTO with over 1,300 F40s being produced from 1987 to 1992.